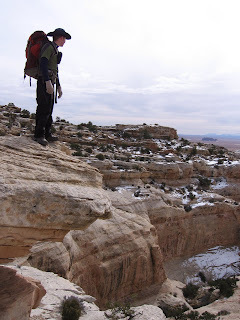 A Day Like This One: Lions, and tigers, and canyons, oh my! 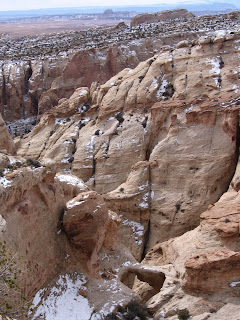 Lions, and tigers, and canyons, oh my! The only thing better than a three-day weekend,is a three-day weekend that includes Valentine's Day. And what made this Valentine's Day even better still is that, for the first time, I had a Valentine. And what did we do? We went to the zoo! It was snowing like crazy but it was so much fun! This is Keith being measured against a mountain gorilla. Not quite. 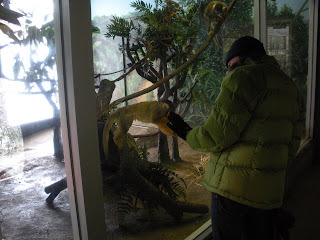 The Golden Lion Tamarins were my favorite. Though I might be biased because I wrote a hefty report on them last year. This guy was enthralled with my umbrella and would follow it across the glass. Keith and a couple of really big tortoises. This room was fun because there were exotic birds flying all over above our heads in the trees. The giraffes were inside so they wouldn't slip on the ice outside (apparently this has been an issue in past winters and they get big neck problems when they slip). I actually got to touch the giraffe on the nose when he stuck his neck out to me. It felt just like a donkey nose. And just like a donkey, I think he was disappointed to find that my hands didn't contain anything edible. This little monkey was interested in my hands as well. He was way cute. 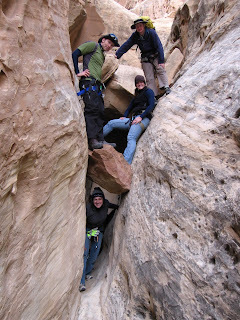 On Monday we explored Farnsworth Canyon and its three hidden arches down in the San Rafael Swell area with some friends. Here is the crew. Keith, me, Dara, and Melissa are below, and Gavin is playing gnome on top. Every trip has to have one of these pics so here it is. Liz: please note my super cute new hat from your favorite store. I thought of you. It even has a little tassel, though you can't see it in this picture. Gavin, Dara, and Melissa on our little detour. We will just refer to it as a practical lesson in topo map reading. Me staying high and dry. One of the hidden arches (at the bottom of the picture). Keith on a ledge above one of the arches. Me from the place we rappelled from. 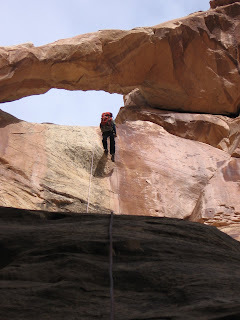 Me rappelling through the third hidden arch. This is from the base of the rappel looking up. It was a 200ft rappel with some overhangs. Fun stuff! Keith on his way down. The whole crew (minus me) a little ways down canyon from the big rappel. The rappelling gives me the heebejebees! I'm glad you guys had a fun time - looks like a blast. Was that the Hogle Zoo? It looks like so much fun! Would you say it'd kid-friendly?